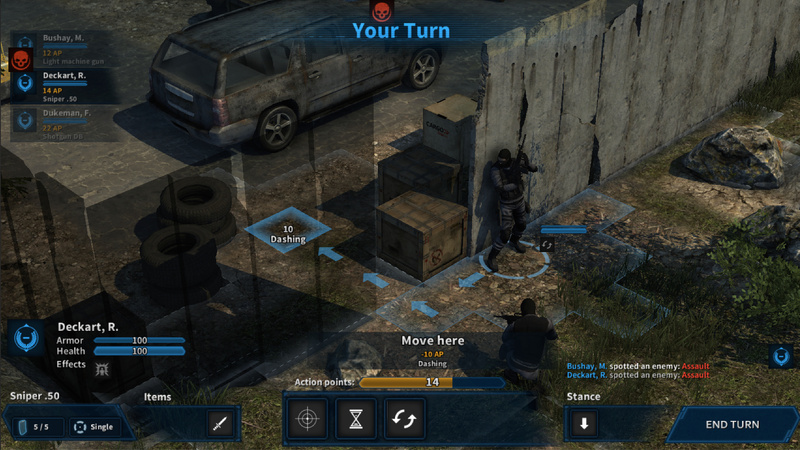 - Turn-based tactical combat, with action points and interruptions. - Interactive levels with different types of cover, peeking around corners, climbing through windows, destuctable walls and objects and more. - Stealth options with advanced visibility and hearing systems. - Range of modern weapons from pistols to sniper rifles with varying accuracy, reaction, damage, penetration and more. - Varying mission types capture intel, eliminate high-value targets, rescue hostages and more. - Strategic layer where you manage your operatives, skills, equipment, leads and missions. I know everyone atm is kinda bummed out due to JA:F failure, but looks like at least we might get a decent turn-based tactical squad game based on Unity, even though it's not called Jagged anything. I will root for any tactical shooty game, even if it doesn't have "Jagged" in the title. Not all too promising in my eyes. What I mean is that it looks... bland. It does look at bit too bland and gloomy atm, but eye-candy is the last thing you want to focus on early into development. Look at JAF. There are some amazing sectors in it, but if the core stuff is broken, people won't give you any pluses for artistic impression. It also bears some similarities with JAF due to the fact that they are both built on Unity. But hopefully these folks aren't as short-sighted as FC was when it came to interface design or strategic movement. I mean they already seem to have though of most of the things lacking in JAF, haven't they? I am Henry, the developer. To be clear we are not exactly a "studio" at this point, there is mostly just me and few friends and ex-coworkers, who are also professional artists and game developers, who help out when they can. Personally this is a "dream" project for me and last few years I have done everything I can to make it a reality. So if you have any questions or feedback I'll be listening! Yeah I agree that does not sound too good and the UI really is bland. I have focused to make the gameplay as good as possible and along the way many things have changed that affect the UI. When the things have found their place I would like to have the UI designed by real artist instead of a programmer (me). About the weapons, currently there are only prototypes of the weapon categories: pistols, SMGs, shotguns, assault-, battle- and sniper rifles, LMGs and so forth. I want to find the balance in the statistics for these so that they each have a functional role, after that I would like to give the weapons more personality and add variations within the categories. I guess you followed the JA:F debacle, considering their game was Unity too. So you probably know already what JA:F sorely missed the mark on. Haven't seen a mention of the rooftops anywhere, are multi-level maps in Unity so hard to make as FC said or you didn't yet get around to them? Hey, yes I have been lurking here from time to time. Multi-level maps are not exactly a problem of Unity, it has more to do with how do you choose to do your maps. It is easier to do just one level because then you can make your mechanics basically 2D, just with 3D graphics. I have always kept it in mind when developing the other systems (especially line-of-sight), but I haven't focused on getting it done yet as there have been other features with higher priority. I do understand it is important to many players and it does give a lot of tactical options. Quick question (haven't found info on this on the site): Will there be realtime movement if there is no enemy contact for a while? There are quite a few modern TB games that don't have that (the new X-Com and Shadowrun come to mind), which makes everything outside of combat an absolute annoying drag. Currently not implemented, it is on the list though. They say on Steam page "last quarter of 2015" for alpha. Do we have a stategic map, where we can walk arround, just like in JA2 ? @Kostaja, yes early access is the plan, I have thought about releasing a free demo version as well. @tais, weapon parameter modding is going to be there for sure, since I am certain many players will want to edit those. @Peal, the strategic map is very much work-in-progress at this point, so please don't hold everything I say against me. The plan is not to have every sector designed like in JA2, but something more like the world map in Fallout 1 & 2. The goal is to give the player the feel of designing and executing special forces operations, with route plans to mission and an extraction plan to get back to base. Oh by the way, there is the "Devlog #1: Movement and positioning" with descriptions of movement mechanics in the Steam page and also the main site, in case you haven't seen them! I am also working on the next post so stay tuned. i hope to see more in the future. this looks realy interesting. @phosphorus, there's a huge difference between tweaking just parameters and being able to add new items and fully edit existing items, including images/models. @Shadow21, Thanks! I have received that feedback about the peeking few times before. I agree it does not look like something a highly trained soldier would do, hopefully we will be able to do better animation for it later. @tais, I know, but it is too early to promise more though. At this point I am not sure how exactly the system will be in the end, and also don't know when I will have the time to look at it closer. I hope you understand. As a general rule I will try to make everything so that it is possible to modify or to make it modifiable later, but still the main objective is just to get the game as a whole done first. @phosphorus is this game dead? would be sad it looked really promising. @Guess - it's true their Steam page is quiet since august, but did you see any clear announcement/news that the game is dead? No. Just peoples posts on the page. I take steam comments and posts with a grain of salt but the silence from the developer is telling. Making a game is a daunting task (as opposed to making a proof of concept). So I don't expect a small team to produce results too fast. They have no KS funds at their disposal, so End State will most likely will be produced (if ever) on their spare time much like mods here. And judging from the usual timeframe of a modding project, that means years. there was a reply on steam from phosphorous, he stated that the game is advancing albeit at a slower pace than expected. Omg someone actually in the industry I want to get into! If only I had a decent portfolio to show you good sir.